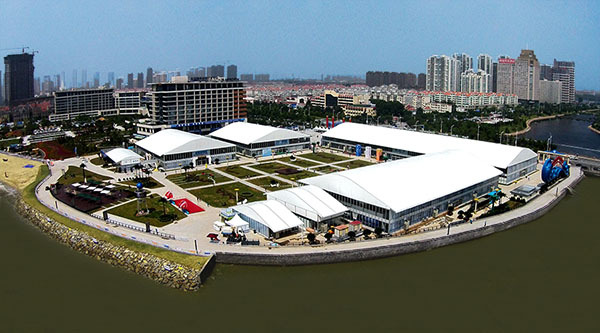 Suggestions on the layout of the exhibition tent - Shanghai Ruikai Tent Manufacture Co.,LTD. 1. Choose a color scheme. The exhibition tents of the commercial suppliers you buy are usually white, but the clever use of color inside the signs and tents will make your products and services more attractive to the viewer's eyes. For example, a red-and-white banner, a red-decorated booth, and a red border on some of the smaller logos and price tags will look eye-catching and appealing. 2. Choose the booth that best shows your merchandise. For example, leaning against the square table of the side wall of the exhibition tent, draped with color-coordinated fabrics, and placed some small goods or crafts on it. Add a layered platform to get more display space. At the same time, it is necessary to set aside 3 to 4 meters between the booths to avoid congestion. Things look better when they are hung up, like textiles, and can be hung from the frame of the tent. 3. Design an attractive entrance to make your exhibition tent unique. Place a waisted table on either side of the front of the opening of the exhibition tent, then put your sample or colorful booklet as a creative way to attract the attention of the audience. Hang some brightly colored objects on the beams above the door of the exhibition tent, such as bells or festive ornaments. If the show can provide electricity, design a light area with small lights or small spotlights in front of the exhibition tent. 4. Identify one or two elegant accessories to make your interior of the exhibition tent more aesthetically pleasing in a pragmatic way without affecting your main purpose – sales or communication. For example, if you are exhibiting jewelry, provide a mirror with a gorgeous frame, so that customers can try on a necklace to see if it suits them. For some of the more commercial exhibition space design, you can arrange some elegant flower arrangement or influential inkjet printing in some spaces. You can use high-tech inkjet technology to spray the company logo or the theme you want to express on the triangle of the exhibition tent. 5. Set aside some rest space for better work. If you have a folding soft chair to sit and rest during the activity, your high-intensity exhibition will be more efficient. If your mission in the exhibition requires you to stand for a long time, you can leave a small corner on the floor of the exhibition tent so that you can rest your legs and body. At the same time, you can install an air-conditioning system for your exhibition tent. The exhibition tents under 4 meters can be installed with a direct-blowing central air-conditioning system, and the exhibition tents with a height of 5 meters or more can be installed with a duct-type air-conditioning system.